God took the initiative in creation. God took the initiative in redemption. God takes the initiative in the relationship and communication we call prayer. 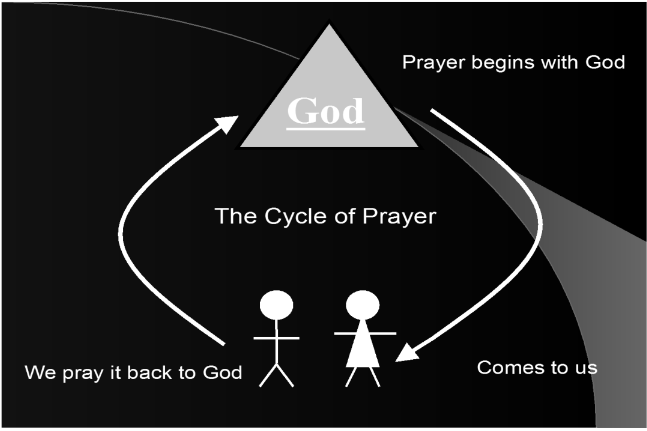 Prayer begins in the heart of God, it comes to us, and we pray it back to God. Silence for 30, 60, or 90 seconds: As things come to your mind, silently lift/pray them back to God. Share with your neighbor (not your spouse) what went well and what surprised you. Open the conversation for group reflection. Close session with the Lord’s Prayer, “ Our Father….